Dan Biggar says his burgeoning Ospreys half-back partnership with Rhys Webb is making it a "pleasure" to play rugby. Fly-half Biggar recorded a 100% kicking record in Saturday's 19-14 Pro12 win at Munster, converting Jeff Hassler's try and adding four penalties. But it was his Wales colleague Webb who won man of the match at Thomond Park for a fine scrum-half performance. "He [Webb] deserves every bit of credit he's getting and it's making my job a hell of a lot easier," Biggar said. Ospreys move back to the top of the Guinness Pro 12 with battling 14-19 win over Munster at Thomond Park. "It's a pleasure to play behind this fella at the minute, he's absolutely on fire and for us to form a bit of a partnership it makes life a lot easier." The half-back partnership between Webb and Biggar has been one of the driving forces behind Ospreys' unbeaten start to the season, which sees the Welsh region top the Pro12 table, ahead of Glasgow on points difference. Wins over Treviso, Newport Gwent Dragons and Edinburgh were backed up by victory in Limerick, with Biggar and Webb pulling the strings behind an impressive pack performance. "It's a young squad we've got, we're making no excuses about that, but the way they toughed it out... for us just to come away with a win is what pleases us most," Biggar told Sky Sports. "We're four from four and that's a big start for us to build on... who knows what we can go on and achieve this year now. "Obviously we're grabbing a few headlines for scoring a lot of tries but we know we have to take that with a pinch of salt. "We know that the hard work comes in places like this [Thomond Park], this is what you earn your money for." Webb, whose regional partnership with Biggar could be replicated for Wales in the autumn internationals, was also delighted with the win in Ireland but warned that Ospreys still need to improve. "This was our first proper test of the season so far. 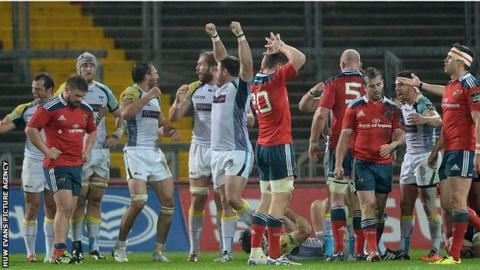 Munster - what a great team they are - put ourselves under a lot of pressure," Webb said. "But we've got a lot still to do, a lot to improve, we can't afford to keep going behind and coming back again, we need to keep the scoreboard ticking over."